Coretta Scott King (born April 27, 1927 near Marion, Alabama) is the widow of the late civil rights activist Martin Luther King, Jr. and a noted community leader in her own right. Yolanda Denise King (November 17, 1955, Montgomery, Alabama). Martin Luther King III (October 23, 1957, Montgomery, Alabama). Dexter Scott King (January 30, 1961, Atlanta, Georgia). Bernice Albertine King (March 28, 1963, Atlanta, Georgia). She has been vocal in her opposition to capital punishment and the 2003 Invasion of Iraq, thus drawing criticism from conservative groups. 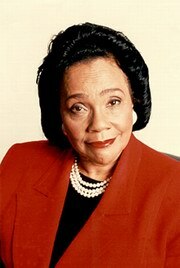 Mrs. King is also a vocal advocate of women's rights, lesbian and gay rights and AIDS/HIV prevention. Over the years, she has not only been active in preserving the memory of her husband, but also active in other political issues. After her husband was assassinated, she began attending a commemorative service at Ebenezer Baptist Church in Atlanta to mark her husband's birth every January 15 (now on the third Monday in January since Martin Luther King Day was proclaimed). She also has honored presidents in different occasions. Some of them include being at the state funeral of former president Lyndon Johnson, in 1973, being present when President Ronald Reagan signed legislation establishing Martin Luther King Day, and being present at the first inauguration of George W. Bush in 2001. On August 16, 2005 Mrs. King was reported by the news network CNN as having been hospitalized and in stable condition. No specific information regarding the reason for her hospitalization was given, and further information is yet to be heard. The following day, it was reported that she suffered a stroke and is partially paralyzed.